October 3, 2015: Presentation by Norma Kraemer titled “Early SD Aviation” at the Tri-State Museum in Belle Fourche. 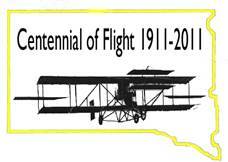 June 6, 2015: Traveling photo display “South Dakota’s First Century of Flight” by Norma Kraemer at DeSmet Airport Open House. July 12, 2014: Traveling photo display “South Dakota’s First Century of Flight” by Norma Kraemer at Gettysburg Airport Open House. July 17, 2013 to January 2014: Traveling photo display "South Dakota's First Century of Flight" by Norma Kraemer at Rapid City Airport for Sturgis Bike Rally travelers and others to view. March 7, 2013: Presentation “Nellie Zabel Willhite, South Dakota’s First Woman Pilot” by Norma Kraemer at SD Air & Space Museum Speaker Series at the SDASM, Box Elder, SD. Sponsored by the Ellsworth Heritage Foundation. September 7-9, 2012: Traveling photo display “South Dakota’s First Century of Flight” by Norma Kraemer at “Badlands RV Fly-in,” Hot Springs Airport, SD. October 11, 2011: Large historical South Dakota aviation display at SD Air & Space Museum, Ellsworth AFB. A display of historical aviation photos created by Norma Kraemer was mounted on six panels of the SDPA-purchased "wall" at the SD Air & Space Museum, Ellsworth AFB, next to the display for the SD Aviation Hall of Fame plagues. The display incorporated large format photos from Norma's major museum display previously shown at The Journey Museum in Rapid City and the Cultural Heritage Museum in Pierre (Joe Drab, SD Air & Space Museum Foundation, left; Norma Kraemer, right). September 18, 2011: Traveling photo display “South Dakota’s First Century of Flight” by Norma Kraemer at Chan Gurney Airport Breakfast, Yankton. August 31, 2011: Traveling photo display “South Dakota’s First Century of Flight” by Norma Kraemer at General Aviation Rally, Pierre. August 27, 2011: Presentation “Nellie Zabel Willhite, South Dakota’s First Woman Pilot” by Norma Kraemer at SD Aviation Hall of Fame event, Spearfish. July 12, 2011: Presentation “South Dakota’s First Century of Flight” by Norma Kraemer at Cultural Heritage Museum, Pierre. June 30, 2011: Traveling historical photo display and presentation “South Dakota’s First Century of Flight” by Norma Kraemer at the Short Wing Piper convention at Spearfish Airport. Presentation at banquet program at Holiday Inn, Spearfish. 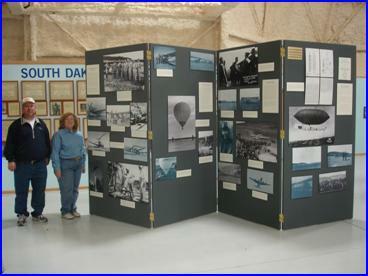 June 4, 2011: Traveling historical photo display “South Dakota’s First Century of Flight” by Norma Kraemer at Ellsworth AFB Open House and Civilian Fly-in. May 7, 2011: Traveling historical photo display and presentation “South Dakota’s First Century of Flight” by Norma Kraemer at Dakota Sunset Museum, Gettysburg. Two restored historical aviation films from 1950s narrated by Steve Hamilton. April 3, 2011: Story Teller Series presentation “South Dakota’s WASP” by Ola Mildred Rexroat, last remaining South Dakota WASP (Womens Airforce Service Pilots) at Journey Museum, Rapid City. April thru September 12. 2011: Major historical photograph and artifact exhibit on “South Dakota’s First Century of Flight” by Norma Kraemer at the Cultural Heritage Museum, Pierre. March 27, 2011: Story Teller Series presentation on the “History of South Dakota Ballooning” by Arly Fadness of the SD Balloon Historical Society at Journey Museum, Rapid City. March 18, 2011: Presentation “Nellie Zabel Willhite, South Dakota's First Woman Pilot” by Norma Kraemer at Minnehaha Historical Society Meeting, Old Court Hall Museum, Sioux Falls. March 6, 2011: Presentation "A Brief History of South Dakota Aviation" by Norma Kraemer at annual meeting of the Minnilusa Historical Association, Rapid City. February 27, 2011: Story Teller Series presentation "A Brief History of South Dakota Aviation" by Norma Kraemer at Journey Museum, Rapid City. February 19, 2011: Gallery Talk presentation "South Dakota's First Century of Flight" by Norma Kraemer at the Journey Museum, Rapid City. February 12, 2011: Presentation "Western South Dakota Takes to the Skies" by Norma Kraemer at South Dakota Pilots Association meeting at Al’s Oasis in Chamberlain. Two restored historical aviation films from 1950s narrated by Steve Hamilton. January thru March 2011: Major historical photograph and artifact exhibit on “South Dakota’s First Century of Flight” by Norma Kraemer at the Journey Museum, Rapid City. December 12, 2010: Presentation “Wings Over Yankton, 1942-43” by Steve Hamilton at YRAA meeting, JoDean’s Restaurant, Yankton. October 24, 2010: Traveling historical photo display and presentation on “South Dakota’s First Century of Flight” by Norma Kraemer at the South Dakota State Archives, Pierre, SD. The Archives showed two restored historical aviation movies from the 1950s. The SD Aeronautics Commission funded the film conservation. September 25, 2010: Traveling historical photo "South Dakota's First Century of Flight" by Norma Kraemer at Cessna 120 / 140 Annual Convention (Hospitality Tent), Spearfish Airport. September 24, 2010: Paper and oral presentation of "Western South Dakota Takes to the Skies" by Norma Kraemer at West River History Conference, SD School of Mines &Technology, Rapid City. Paper published in conference proceedings (available September 2011). Traveling historical photo display was shown in vendor area on September 23 and 24. September 17, 2010: Presentation “Wings Over Yankton, 1942-43” by Steve Hamilton at Yankton Territorial Museum, Yankton. September 4, 2010: Traveling historical photo display and presentation "South Dakota's First Century of Flight" by Norma Kraemer at SD Aviation Hall of Fame event / SDPA meeting, Spearfish Airport. Presentation “Wings Over Yankton, 1942-43” by Steve Hamilton. July 28, 2010: Presentation “South Dakota’s First Century of Flight “ by Norma Kraemer in the Vette Theater of the EAA Museum at EAA’s AirVenture, Oshkosh, WI. July 24, 2010: Traveling historical photo display “South Dakota’s First Century of Flight” by Norma Kraemer at the AirVenture Cup Race event, Mitchell Airport. If you would like to help sponsor the traveling display of historical photos or the major exhibit, please contact Norma Kraemer at 605-342-2339 and her e-mail address is nkraemer@q.com. The SDPA has donated $1,000 toward the traveling photograph exhibit. The SD Aeronautics Commission has pledged $4,000 toward the cost of doing the major museum exhibits. The book “South Dakota’s First Century of Flight” by Norma Kraemer has been completed and should be available in August 2010. The book is being published by Arcadia Publishing (www.arcadiapublishing.com). The format of the book is pictures with captions and a limited amount of text. It will not be an all-inclusive history of the state’s aviation history, however, the picture format will keep pilots and the public entertained and informed. The first flight of a heavier-than-air aircraft was in Rapid City, SD, on March 9, 1911. The plane was brought here by the Western South Dakota Stockgrower’s Association for their convention and was a contracted exhibition using a Curtiss Model D pusher. In September 1911 the State Fair hired several demonstration companies to perform for the entire week. Over the next several years planes made appearances at Deadwood, Sioux Falls and Yankton (1912), Spearfish, Edgemont and Belle Fourche (1913), Vermillion and Ft. Pierre (1915). Over the years I have seen various references to “firsts” in aviation throughout the state that conflict. It basically shows that news did not travel well between communities before the advent of radio and television. Saxe Pitts Gantz was born in 1883 in Rapid City, SD. In 1898 he moved with his mother to the Klondike for the Yukon Gold Rush. After returning to South Dakota, he attended the South Dakota School of Mines and Technology. He worked for General Electric in Schenectady, NY. He also worked on the Crouch Railroad Line as a Civil Engineer in Rapid City. During WWII he worked in production control at Douglas Aircraft Tulsa, OK.
Saxe attended the Stockgrower’s Convention in Rapid City, SD, on March 9, 1911, when he first saw a plane fly. The demonstrator pilot was Hugh Robinson from the Curtiss Aerial Exhibition Company. Saxe asked about learning to fly and Robinson recommended the flying school at Kinloch Park, MO. Saxe was unhappy with the flying school’s Curtiss Model D, which cost $5,000. He knew he needed a plane of his own so with the help of two other men they built a replica in about 2 months for $3000. The aircraft was powered with a 50HP Roberts engine that cost $1150 and had an empty weight of about 1500 lbs. While teaching himself to fly he said, “We did a lot of grass cutting around the field before we had enough nerve to go airborne.” On his first flight he pancaked from about 40 feet and demolished the plane. He rebuilt the plane and steeled his nerves to return to the air for a successful flight, and was the first South Dakotan to fly an airplane. For $800 he flew four flights at the Clinton County Fair in Breese, IL. He had a contract to fly at Laramie, WY, for $2500, but his plane was destroyed in shop fire in St. Louis before he arrived. Saxe never flew again. Saxe died at Custer, SD, December 31, 1959, at the age of 76. He was cremated and his ashes are buried at his tombstone site at Silver City, SD. Saxe Pitts Gantz was inducted into the South Dakota Aviation Hall of Fame September 11, 2009. Charles Lindbergh toured the lower 48 states in 1927 after his record setting fight to Paris. South Dakota had one of the more unusual events on his tour. Lindbergh landed at Sioux Falls’ Renner Airport (initially called Lindbergh Airport, but renamed Renner so people would know where it was.) From there he was to visit Sioux City, Iowa. However, Sioux City had no airport of its own. The only airport in the area was at what is called North Sioux City, named Rickenbacker Field. When Lindbergh scheduled his landing, the people of Sioux City failed to realize that the airfield was not in Iowa . They sent the Iowa National Guard to protect Lindbergh, only to be faced down by the Union County Sheriff and the chief deputy state sheriff. The Union County State’s attorney, who had been deputized, hit the Iowa Guard captain with a right to jaw that left him on the ground when challenged by the Guard troops. After the Captain returned a punch breaking the attorney’s glasses, the captain ordered his men to “fix bayonets.” With that, one of the sheriff’s deputies pulled a .45. While the Iowa captain was still punching it out, his Sergeant ordered the Iowa troops to stand down. The Guard slinked away to the catcalls of the crowd. When Lindbergh returned to his plane to fly on to Pierre the next day he had no idea of how well South Dakota protected his plane. Vern Kramer designed and built the first home-built aircraft in South Dakota in 1952 – an American TriWing. Norma Kraemer says, "It was the first one built in South Dakota. And my husband saw a photograph of a plane similar to this. And he made his own blueprints and built it himself. At the time he was a mechanic and was restoring planes anyway. And this one he just did on his own." 1952 was the first year the Civil Aeronautics Administration allowed people to build their own planes. Vern became a pilot in 1940 at Spearfish Airport and flew planes in World War II with the Civil Air Patrol, patrolling the Eastern Coast of the U.S. for enemy submarines. He was a pilot and mechanic and later worked as an Alaskan bush pilot and professional pilot in Seattle before moving back to his Nemo ranch in the Black Hills in 1949. In its prime the plane could fly at about 70 miles per hour. Vern flew the plane around Rapid City until 1958 when Halley Airport closed due the building of Interstate 90. In 1959 he donated that plane to the EAA Museum in Hales Corners, WI. When the EAA Museum moved to Oshkosh, WI, in the late 1980s, the TriWing was inexplicably destroyed by EAA (burned up the wings). After some persistence on Vern's part, they returned the fuselage cut in 3-foot pieces in the box in 1991. They kept the engine and instruments without permission. In 2000, Vern started the restoration by welding the fuselage back together. He reconstructed the wings from his blueprints and welded the struts for the wings. Once everything was in the proper position, Vern covered the plane with fabric -- with the intent for the restored aircraft to be statically displayed, not to be airworthy. As of October 2008, Vern had welded the fuselage back together. He had reconstructed the wings from his blueprints, refabricated the struts for the wings, and covered and painted the aircraft. Vern’s wife Norma found an engine on eBay that matched the original -- a Lycoming O-145 engine. Larry Vetterman of Hot Springs took the engine home, and based on Vern’s photos of the original engine and exhaust system, made the air intake tubes and exhaust system. The completed engine was hung in 2012. A mutual acquaintance, Milo Schindler, told Cameron Humphres, Airport Manager of Rapid City Regional Airport, that Vern might be willing to donate the plane to the airport. Humphres made the arrangements with Vern and Norma for displaying the plane in the newly renovated passenger terminal.